As Islamic finance is still at the infancy stage, the industry is facing numerous road bumps and legal hurdles all over the globe, including Malaysia. From 1987 to October 2012, the Malaysian courts decided a substantial number of cases involving Islamic finance matters. The decisions made in the reported cases stirred controversy and debates in the market; the regulator, market players, academics and even the end consumers all had something to say about them. Some decisions in the reported cases involving Islamic financial transactions have had an undeniably adverse impact on market confidence and stability. Due to the court decisions, the regulator has amended the existing laws to enhance its regulatory framework in the attempt to maintain market stability. Yet market players remain uneasy about the trend in legal decisions, and stakeholders have realised the urgent need for a stronger legal backbone for the Islamic finance industry. 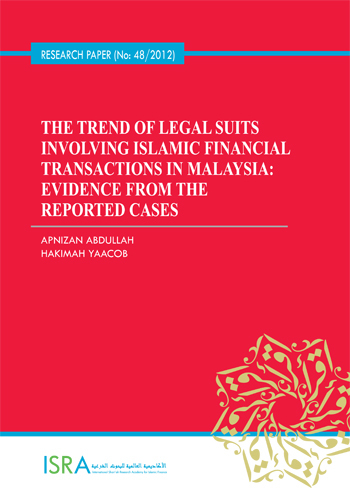 A few previous studies have analysed the development and features of cases involving Islamic finance disputes and the courts’ attitude towards them. However, the need remains for a critical study on the trend and pattern of those decided cases in Malaysia. Hence, this study aims to provide a critical analysis of the reported cases in Malaysia involving Islamic financial disputes in the period from 1987 to October 2012 with a particular focus on the trend and patterns in them. The study then discusses the impact of those cases on the Islamic finance industry and recommends the possible immediate legal redress and remedies to its stakeholders, particularly the regulator, banking institutions and the consumers, in order to ensure the continuous growth of the industry domestically and globally by backing it with a strong and viable regulatory framework.